A week before Adi Kanga died he could not remember what he had for breakfast, but he could explain Pythagoras’ theorem to you. He was an all-rounder: a mathemati­cian, an imaginative artist and one among few others who had planned Navi (New) Mumbai. In the late 1960s a group of friends including Kanga, a civil en­gineer, lamented that their city, the bustling Bombay (now Mumbai), was overpopulated. As the com­mercial capital of India it was at­tracting large numbers of citizens, which the available infrastructure could not cope with. So the friends came up with the concept of build­ing a new city, New Bombay, on the mainland, across from the seven islands of the old city. They convinced the Indian gov­ernment of their plan. The govern­ment set up a corporation to plan and build this new city and Kanga was appointed general manager. The task was overwhelming. Just to start with, the landowners on the mainland were not inter­ested in selling their farming prop­erties for urban development and there was no direct transport link from Bombay anyway. 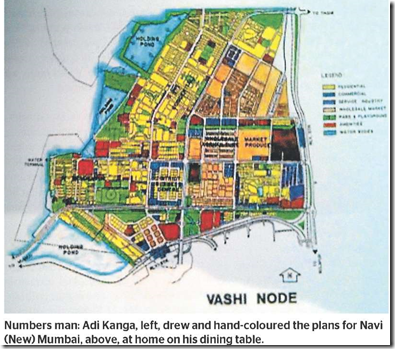 Kanga decided to reclaim land in the sea off the mainland and estab­lish the first township at Vashi. He drew the plans at home on his din­ing table, hand-colouring it to beautify it and sell the concept. 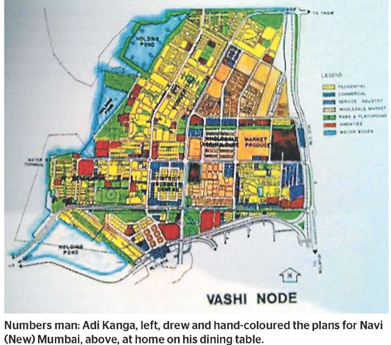 He planned a huge bridge from the is­land of Bombay to Vashi and gradually the new city emerged. Today, Navi Mumbai, with a pop­ulation of about 7.5 million, is more populous than Sydney, Brisbane and Perth put together. The city is serviced by trains and buses and the bridge that was once perceived as a bridge to nowhere is so crowded there is demand for a second crossing. Adi Kanga was born in Bombay in 1923, the fourth of five children. He was a Parsee Zoroastrian, a minority community known for its philanthropy. The Parsees were also the pioneers of cricket in India and two of Adi’s uncles had repre­sented India. His elder brother, the late Homi Kanga, became a renowned violinist in the London Philharmonic Orchestra. Adi played the piano and mandolin. Adi grew up in Bombay and graduated in science from St Xavier’s College then completed a de­gree in civil engineering in Poona. At first he worked for the Water Works Department of Bombay, building two huge dams. In 1950, he married Vira Vazifdar. 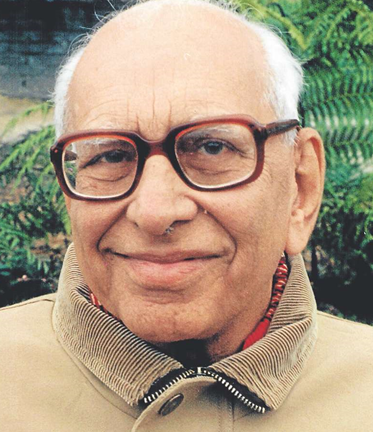 He was then seconded to a gov­ernment research organisation, where he developed applications software for India’s first major computer system at the Tata Insti­tute of Fundamental Research. In the 1980s, he retired and moved to Sydney with Vira to join their chil­dren, who had migrated. His main hobby was mathemat­ics and made a number of discover­ies, including several extensions to Pythagoras’ theorem. His book Number Mosaics: Journeys in Search of Universals, published in 1995, continues to sell well. Kanga was a prolific artist, pro­ducing handmade cards for every occasion. His paintings now adorn homes around the world. He wrote poetry and illustrated his poems with drawings that are treasured possessions of his family. He also believed in education. Four of his grandchildren are working on PhDs in fields as di­verse as music, science, law and architecture. His son Rustom is the CEO of his own company, his daughter-in-law Dr Marlene Kanga is the president of Engineers Aus­tralia and grandson, Zubin Kanga, is an internationally known pianist. During Kanga’s last few years at the Lady Gowrie Nursing Home, he was well known for entertaining his friends with his piano playing. Adi Kanga is survived by his sons Rustom and Darab, daughter Prochie and six grandchildren. Vira died in 1999. The above obituary was published on page 42 of Sydney Morning Herald of April 30, 2013. Link sent to Parsi Khabar by good friend and reader Rusi Sorabji.